I posted two quick tutorials on the Design Team blog Friday, and one yesterday, so it is time that I post here with more ideas! Today I am painting the AA Velvets directly onto my stamp, then using a painted stencil for the background. If you try this, I STRONGLY suggest that you have water and cleaning tools right next to your elbow. These paints dry fast. It is an advantage of the paint, of course, but you also want to protect your other supplies. I washed my stamp, stencil and paintbrush immediately with no ill effects to any of them. First, I painted the flower portion of the Whimsical Garden stamp with Desire Velvet Dimensional Medium. I painted the stems with Limeaid Velvet. I immediately stamped them on paper. I wanted to see if I could get two printings of them -- and the second turned out pretty well - a little lighter, of course, but still usable. Here Kitty, Kitty...15% is disappearing at midnight Wednesday! If you get my Friday email, chances are you have seen these cards - in a small format. I am posting them again so that you can see detail, and to remind you that all of the stamps on the newly designed Technique Junkies website are on sale for 15% off, only through Midnight tonight!! Hurry and place your order -- we can all use an extra little bit off, right? 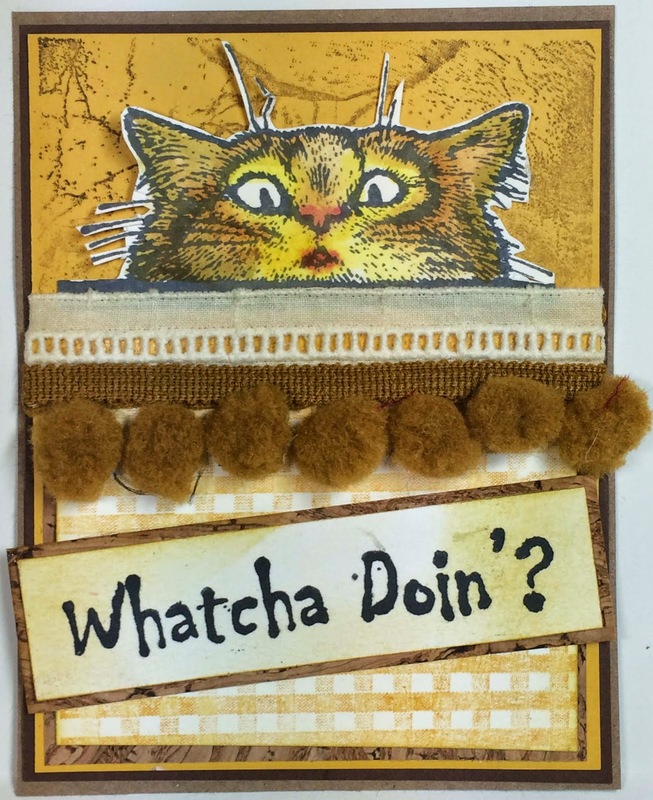 The card above uses two of the most-ordered stamps this week: Whatcha Doin'? (SDX052) and Kitty Watching (SD635). In addition to those two brand new stamps, I also used a couple of classics -- Gingham (S416) on the bottom, and Veined Marble(S201) on the top. I love having a plethora of texture stamps -- who needs designer paper when you can create your own? I posted the other two cards to the Design Team blog for today, too -- go take a look! Today is the kick-off blog hop for the new Design Team, New Website, and New Stamps! If you arrived here from Sally Lynn MacDonald's blog, you are in the right place. If you started here, I urge you to start at the beginning (the Design Team Blog, HERE) so you can follow along. With so many new designers, the Hop is one of the best we have ever done! We have dozens of new stamps for you to see on the BRAND NEW Technique Junkies site. The site is better organized, easier to navigate, and contains tons of inspiration! The design team has given you a taste of what you will see - now go look at the rest. ALL STAMPS ARE 15% OFF FOR THE NEXT WEEK. The focal point stamp I used above is brand new - called: The Right Shoes. You can find it HERE. Thank you for coming today -- I hope you enjoyed the hop and I hope you will love the new site!